As an African country that has a fairly high rate, Uganda attracts many entrepreneurs who want to install VoIP hardware to terminate international traffic. The high penetration of mobile communication and the possibility of cheap calls within the country provide good conditions for termination. In addition, there is a quite well-developed Internet services market is in Uganda. But how about the situation with Internet tariffs? Uganda was one of the first countries in Africa to the south of the Sahara where the Internet became available. In Uganda, the number of Internet users has reached 13 million. The country has access to underwater fiber-optic cables and provides broadband access services. Among all countries of the African continent, Uganda stands at 15th position in terms of the level of development of the Internet market. 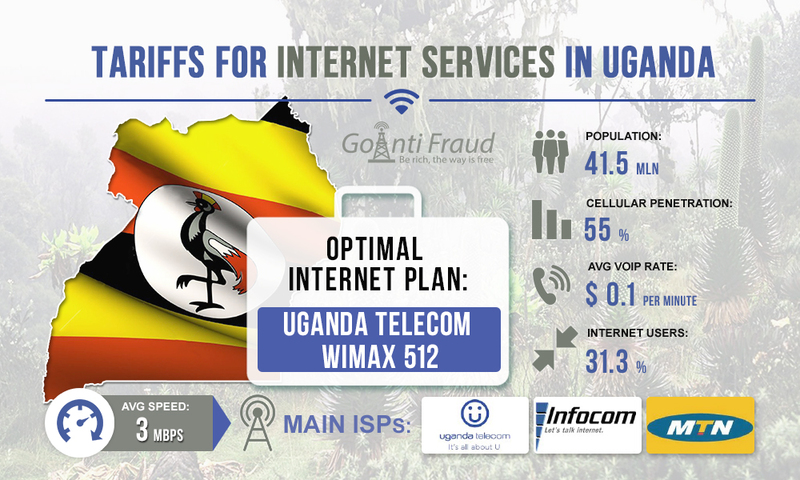 Among the major Internet providers are Uganda Telecom, iWay Africa, Infocom, and MTN Uganda. The country has access to ADSL, WI-FI, and WiMax technologies. The average download speed is 3 Mbps, as well as the fastest Internet is available in the capital of Uganda - Kampala. 128 Kbps. The cost is $22 per month. 256 Kbps. The cost is $33 per month. 512 Kbps. The cost is $55 per month. It is better off choosing the Internet plan that provides the highest speed - 512 Kbit, with a subscription fee of $55 per month. This speed will be enough to terminate calls through gateways equipped with a small number of channels.